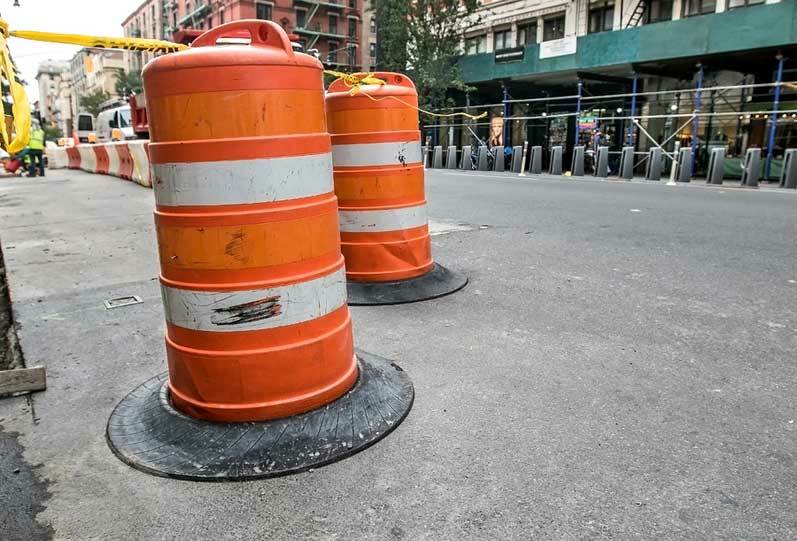 Orange barrels mark construction project in Manhattan. Extensive road construction can disrupt traffic, hinder parking, and cripple local shopkeepers. A road construction project is one of the most disruptive events that can possibly face any business. Disruptions in traffic flow, parking restrictions, and a noisy, dirty construction zone can change the buying habits of even the most loyal customers. Shopkeepers need to be creative and resourceful to stay profitable. But a street construction project—particularly one that is goes beyond than just repaving—requires an entirely different approach. They must keep customers from instinctively fleeing the orange barrels, dump trucks, and rumbling, heavy equipment. In planning and executing road construction projects, municipalities and contractors traditionally ignored the importance of “construction mitigation” for businesses affected. After all, they’re engineers and builders—not marketing professionals. But eventually, when unexpected delays on large-scale construction projects threatened disaster, beleaguered shopkeepers in multiple states began to loudly complain about a process where they had no input. A full-scale project, often lasting between 3-5 years, forced public officials—both at the state and local levels—to consider including pre-construction involvement from businesses located in the construction zone. A new term was coined: “construction mitigation,” defined as an evolving set of remedies that promised solutions beyond the usual public meetings, temporary signage, and traffic control. Ongoing, two-way communication is becoming the norm and, coincidentally, having a positive impact on the public’s attitude about road construction projects. Although this new approach acknowledges the importance of involving business owners as well as other segments of the public impacted by street construction, there is no single formula for success. Mitigation might result in a desirable outcome in one community, then not work so well in another. Results depend on both business and public attitudes towards construction in general, the willingness of local officials to open lines of communication with stakeholders, and the role of the contractor as an important liaison in day-to-day contact with shopkeepers. If you are facing a major road construction project, do you really understand how it will impact your business? In my own area, Village of Wauwatosa business owners were told that they should expect a 33-75 percent loss in revenue during a seven-month project. The key to success is mapping a workable approach to conducting business. The number-one goal is to keep customers coming back. That includes knowing what public officials are planning, getting involved in the process, and staying active until the final ribbon-cutting ceremony. One final thought: Formulate an aggressive marketing plan to help survive this challenging experience. That way you can get a better grip on the future of your business as well as your community.